There’s been a series of recent scandals in Romania's healthcare system that would seem implausible if written by scriptwriters in western Europe. 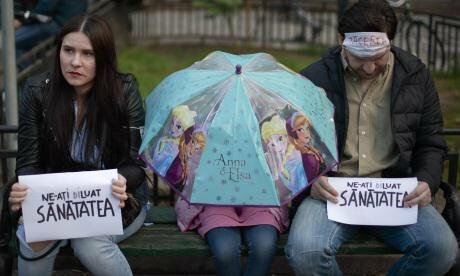 Protesters hold signs reading "You have diluted our health" in Bucharest. PAimages/Vadim Ghirda. All rights reserved.Just over a month ago a Romanian pharmaceutical company, Hexi Pharma, was caught selling watered-down hospital disinfectants throughout the country at a marked up price. Some products were diluted to one-tenth of the strength stated on the bottles - making them incapable of killing lethal bacteria. The sham disinfectants were used by Romanian forces in Afghanistan, and in emergency hospitals where victims were taken after a deadly fire at a Bucharest nightclub last October, a blaze that claimed 27 lives at the scene and 37 in the days and weeks following. Many died in public hospitals from hospital-contracted infections; which led journalists at Gazeta Sporturilor to investigate hospital supplies and to uncover Hexi Pharma’s fraud. The chief executive of the shamed company, Dan Condrea, drove his car into a tree and died - in a suspected suicide - the day before he was due to for questioning by prosecutors on May 22. Hexi Pharma had over 350 contracts to supply hospitals across Romania - a fact that has rattled public confidence in a notably corrupt health system. ’It’s a horrendous affair and the public feels very unsafe. Many people think that hospitals generally aren't safe, and that they were lied to by officials,’ says Dr. Bogdan Tanase, president of the Doctors’ Alliance, an independent body representing 30,000 medical employees in Romania. The backlash has forced a health minister to resign; while angry protesters marched the streets, some carrying a clear a message: ‘corruption kills’. The disinfectant debacle managed to shock public imagination: not an easy task in one of the EU’s most corrupt countries. Still, people hoped that something as sleazy and dangerous as watered-down disinfectants in the healthcare system was a standout case. But the extent of malignancy is being revealed as new ghastly scandals come to light. Last week 77 oncologists were charged with bribery for prescribing specific cancer drugs to patients in exchange for a holiday to India, allegedly funded by the importer of the drugs. Prosecutors claim the bribe was covered up as a breast cancer conference in Bangalore, but that the doctors attended only for a few hours, while holidaying most of the trip thousands of kilometres away in New Delhi. Following this, over 250 patients have apparently fallen victim to the secret experiments of 50 psychiatrists who have allegedly used unwitting patients as guinea pigs in medical trials, by falsifying patients’ diagnoses, medical records, and even signatures. Prosecutors are searching and investigating hospitals and doctors across Romania. Out of the EU 28 countries Romania has the highest rate of avoidable deaths at almost 50 percent, and it is common for doctors - ho receive salaries as low as £250 per month — to take cash payments for services in a culture often referred to as ‘the envelope’. Preventing bribes will be tough going. But there is hope between the muck, and advocates who call for for a more transparent, less corrupt Romania will recognise it as the National Anticorruption Directorate (DNA). It’s a specialised agency that is charged with investigating high-level corruption and is pressured by the EU. Last year alone DNA scalped 1,250 officials; including mayors, MPs, and ministers. The urgency in clearing up corruption in Romania’s healthcare sector - while no easy feat - is clear, and it is now firmly in the crosshairs of DNA, which should bring about more progress. ‘For years the health system was corrupted in all possible ways. It was all covered up and nobody wanted to know about corruption in Romania’s healthcare sector, now suddenly it's a shock, but I think it's necessary. It's a moment of truth,’ Dr. Tanase adds.